Comfort food. It means something different to all of us. Macaroni and cheese is a favorite for many, or a freshly baked piece of homemade bread…still moist and steaming because you couldn’t wait to slice it…schmeared with butter. Maybe a perfectly warm and gooey chocolate chip cookie. Or three. Those are all undoubtedly emotionally soothing, but for me cheese and potatoes fall somewhere near the top of my list, too. Creamy and salty and toothsome, any incarnation of cheese and potatoes really hits the sentimental spot. 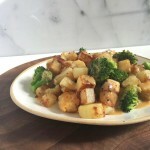 However, when eaten alone they’re lacking nutritionally somewhat as a complete meal, so today’s recipe brings tempeh and broccoli to the party to make a full-on main dish. Comfort food in a skillet. This colorful, flavorful recipe makes for a hearty vegetarian main dish or a cheesy vegetable side dish. Heat olive oil in a very large skillet over medium heat. Add potatoes, ¼ teaspoon salt, and pepper to taste and stir to coat potatoes with oil and seasonings. Cook about 18-20 minutes, stirring several times, until most of the pieces have a nice brown crust on all sides. Cover skillet and cook for an additional 5 minutes or until fork tender. Remove potatoes from skillet and set aside. Return skillet to medium heat and add toasted sesame oil and tempeh cubes. Cook 10 minutes, stirring several times until most of the pieces have a nice brown crust on all sides. While the tempeh is browning, steam broccoli for 6-8 minutes or until fork tender. Rinse with cold water and set aside. Toss shredded cheese with flour and mustard. Bring beer to a boil in a small saucepan. Reduce heat and simmer 4-5 minutes or until volume is slightly reduced. Add cheese mixture and salt, and whisk until cheese is melted. Return to the boil, reduce heat and simmer until thickened, whisking constantly. 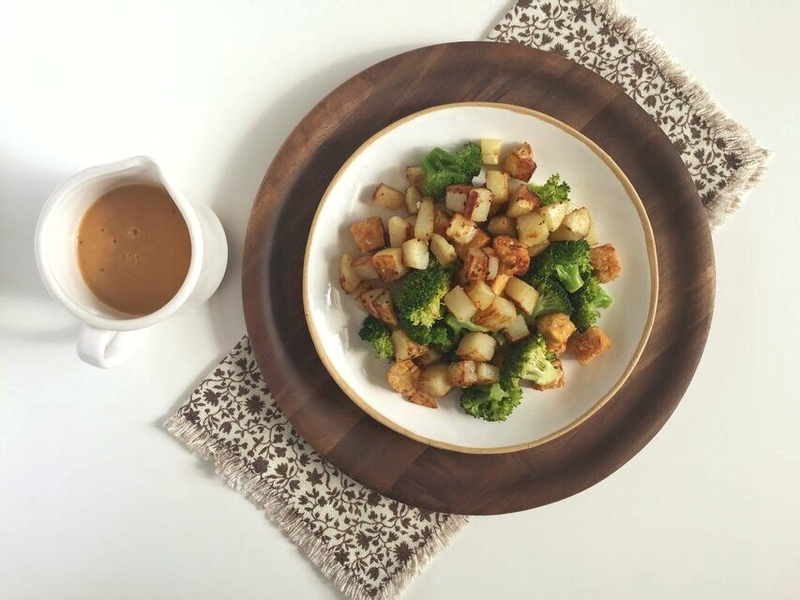 When tempeh is ready, add potatoes and broccoli back to the skillet and cook for 2-3 minutes, or until heated through. Serve topped with cheese sauce. Let’s talk nutrition for a moment. Together, the tempeh and cheese boost the protein level to 25 grams per serving, which is quite respectable. Also, vegetarians (and non-vegetarians) will be pleased to know that 1 serving provides 30% of the Daily Value for calcium and 15% for iron. I think that officially qualifies as a nutrient dense dinner, and we haven’t even added side dishes yet! And, if you’re concerned about potatoes and their carbohydrate content, you might be interested in some recent research suggesting that cooking, cooling and reheating starchy foods improves our response to them. So, this would be a wonderful dish to enjoy as leftovers the next day. This serving is 1/3 of the recipe, which is how we served it up first, but about halfway through trying to eat it all we realized 3 cups was too generous. So, 1/4 of the recipe is much more reasonable and the nutrition facts reflect this yield of 4 servings, or 2.25 cups each. It may seem like this recipe contains a lot of steps. And it does. I do have a rationale for most of it, if you’ll indulge me for a moment to explain. Steaming the broccoli separately adds another task and dirties another pan, so you could try cooking it in the skillet with the potatoes (just add it later in the process since it won’t take as long). 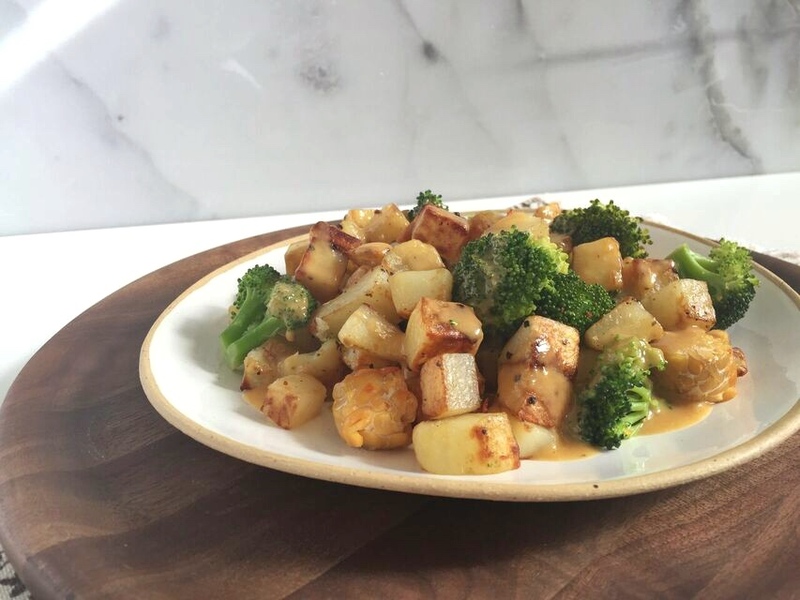 But since the browned and crispy tempeh cubes and potatoes chunks both end up a little on the dry side, I really liked the moistness that the freshly steamed broccoli provided, and I don’t think you’d get that same result with stir-fried or sautéed broccoli. Also, it extends the overall recipe cooking time to cook the potatoes first, set them aside and then cook the tempeh. You could absolutely get the tempeh going in a second skillet alongside the potatoes to save time. I chose to use the same skillet successively, which takes longer, but dirties one less pan. It probably makes sense to try cooking the whole darn thing in just 1 pot, too, but my largest skillet was pretty crowded just with potatoes so the ingredients may not cook efficiently all together. As you near the end of preparing this comfort food concoction, I think you’ll be surprised at how very quickly the cheesy ale sauce comes together for your last step. But, any recipe is just a starting point or an idea for a dish you’d like to eat. Feel free to simplify here and modify there to make it your own. I’d love to hear how the dish ends up looking and tasting in your kitchen. 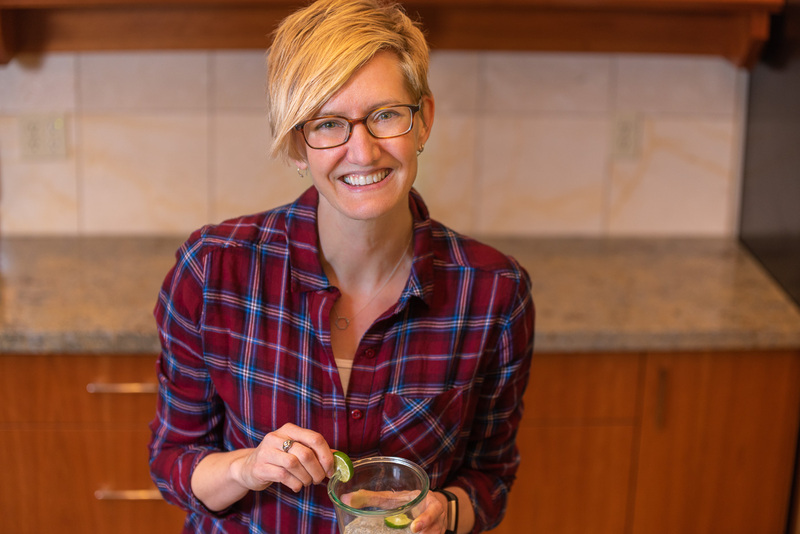 Comfort food definitely has a place in any diet, but it doesn’t have to be an excuse to completely throw caution to the wind, break all the rules, and forget about nutrition altogether (although that’s nice sometimes too). How cool if you could have both at the same time! I think you can: whole foods, prepared thoughtfully and scrumptiously, that provide emotional satisfaction and a little nourishment. I would totally sign up for that. Have you found a way to boost the nutrition profile of a favorite comfort food, so that it’s a sorta healthful choice?